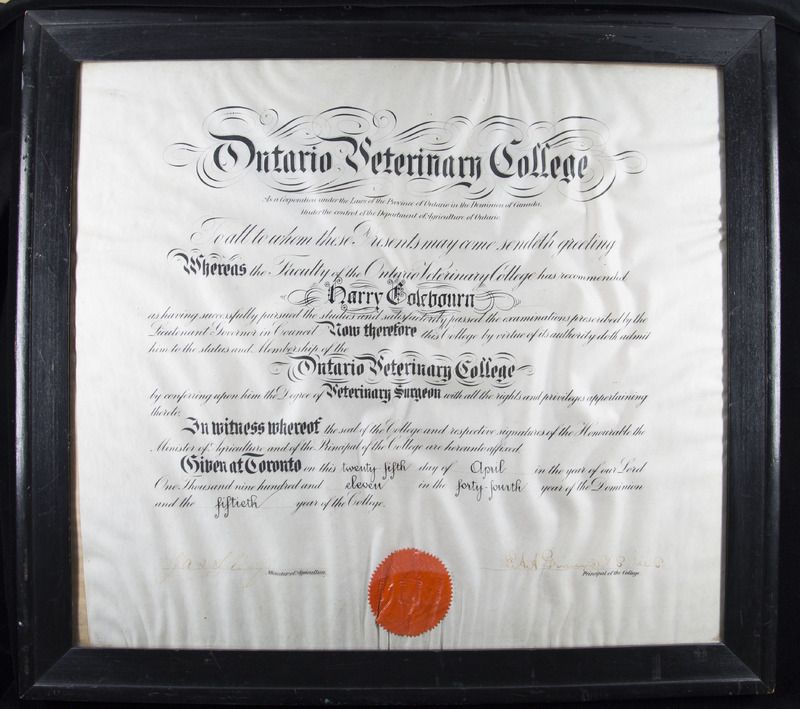 Harry Colebourn's Diploma from the Ontario Veterinary College, 1911. Dr. Lisa Cox, Postdoctoral Research Fellow at Ontario Veterinary College, University of Guelph. Harry Colebourn entered the Ontario Veterinary College (OVC) in 1908, during a significant period of change for the college and the Canadian veterinary profession in general. The OVC raised entrance standards, lengthened the program from two years to three, and made it more scientifically comprehensive. Colebourn graduated from this more rigorous program in 1911. Returning to his hometown of Winnipeg after graduation, he was appointed as a meat inspector by the Federal Department of Agriculture. The passage of the Federal Meat Inspection Act in 1907 and campaigns to eradicate various infectious diseases in this period increasingly brought veterinarians into government service and this work provided many young veterinarians like Colebourn immediate employment after graduation. As a result of the OVC’s raised academic standards and veterinarians’ more prominent public role in activities such as meat inspection, veterinary medicine earned greater professional recognition, which helped to distance the profession from its informal roots. Veterinarians had been members of military regiments in the past, but it was not until 1910 that CAVC was formed as a separate, dedicated veterinary unit within the Canadian Army. Other veterinary units also existed within the British, American and French Armies, as well as the German Army. The members of these units would provide vital emergency and preventative care for the over one million horses, mules, and other animals used in the war.